Nonskeletal carbonate grains are quite variable in origin and appearance. Their value as indicators of the environment in which they were generated is among authors, so care must be taken to define the name that one uses. Our terminology includes lithoclasts, intraclasts, pellets and peloids, and coated grains. Lithoclasts (see illustration above) are irregular fragments of limestones that were eroded and transported within or from outside of the basin of deposition. They are sometimes called extraclasts or detrital grains (right figure). The clast boundary cuts across cement and particles in the fragment, reflecting its well-indurated nature. Lithoclasts are indicative of processes that rip-up, abrade, and transport pieces of previously lithified carbonates. 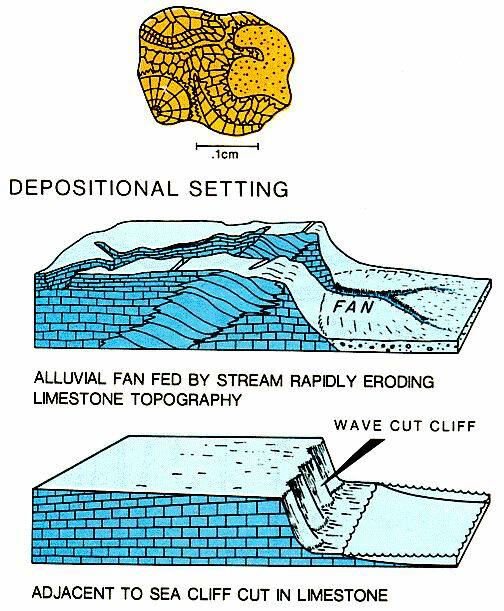 The intraclasts are irregularly-shaped grains that form by syndepositional erosion of partially lithified sediment. 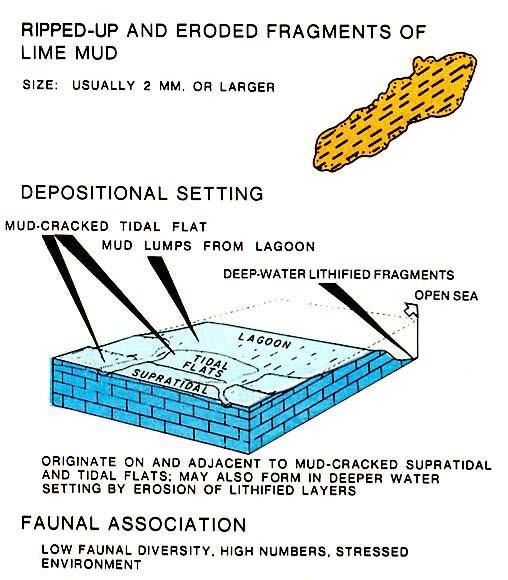 Examples include mudlumps that are torn up from the bottoms of lagoons during storms, hardened desiccated mud flakes produced in intertidal and supratidal environments and fragments broken from cemented deep-sea crusts (above figure). 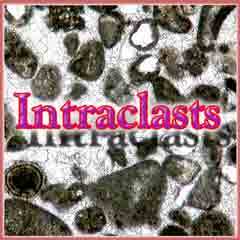 Other intraclasts are aggregates of carbonate particles (figure below). These include grapestones and botryoidal grains. 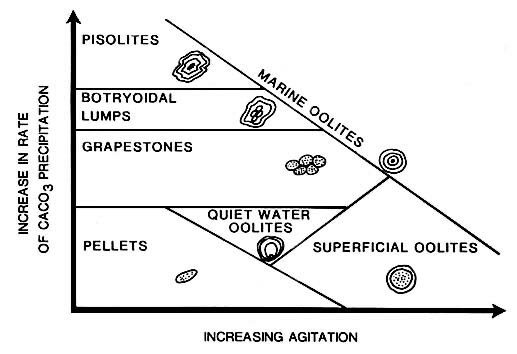 Grapestones are composite grains with an irregular shape that resembles a bunch of grapes, whereas botryoidal grains are similar but with oolitic coats enveloping the aggregate grain. 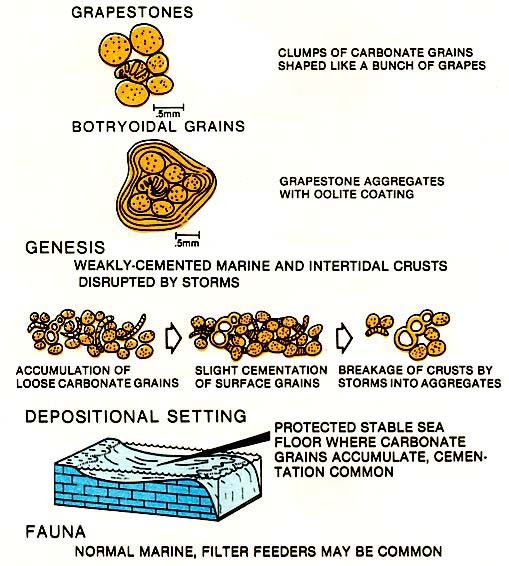 These types of intraclasts from in shoal water environments with intermediate wave and current activity, where grains that are cemented on the sea floor are broken into aggregate fragments and lumps during storms.